Our rates are set each spring for the upcoming academic year. Residence hall rates include high speed Internet connection, telephone capabilities, and parking. Please contact the Office of Residence Life for more information on pricing or with questions about choosing a residence hall. A more traditional residential college experience for our first-year students, Anderson Hall is co-ed by floor and maintains a community-driven environment, housing up to 84 students with shared restroom facilities, laundry rooms, and kitchenette on each floor. Rooms are designed for two students with approximately 151 square feet and include a built-in dresser/wardrobe, desk, chair, twin bed, and internet connections for each student. Triple, single, and small single rooms have limited availability. All students living in Anderson Hall are required to have either a 10-Meal or Carte Blanche meal plan. View a floor plan and more photos. Complete with a private full bathroom, Widenhouse Hall houses the majority of first-year students with a capacity of 201 students who enjoy an active and social atmosphere. Floors are co-ed by room, with men and women sharing the same floor and oftentimes being neighbors. Room configurations include doubles and triples and are furnished with a wardrobe/closet, dresser, desk, chair, extra-long twin bed, and internet connections for each student. Each room is also equipped with a medium-sized refrigerator, microwave, and bathroom with laundry facilities available on each floor. In cases of increased occupancy numbers, triple rooms may be converted to quads at a discounted rate. Students living in Widenhouse Hall are required to have either a 10-Meal or Carte Blanche meal plan. View floor plans for a double and a triple room in Widenhouse as well as more photos. Designed for a more independent living situation, Rimview Hall provides suite-style living with four separate bedrooms; a micro-kitchen complete with a full refrigerator, sink, and microwave; and two bathrooms in each suite. Each unit is approximately 600 square feet and opens up to an inner courtyard and is fully furnished with a desk, chair, wardrobe, dresser, extra-long twin bed, and internet connections in each bedroom, as well as a couch and chairs in the common areas. Rimview Hall is a popular choice for students who are of at least sophomore standing. Community laundry is available on the ground floor in the lounge. Students can do homework or watch TV in this space as they wait for their laundry to be finished. 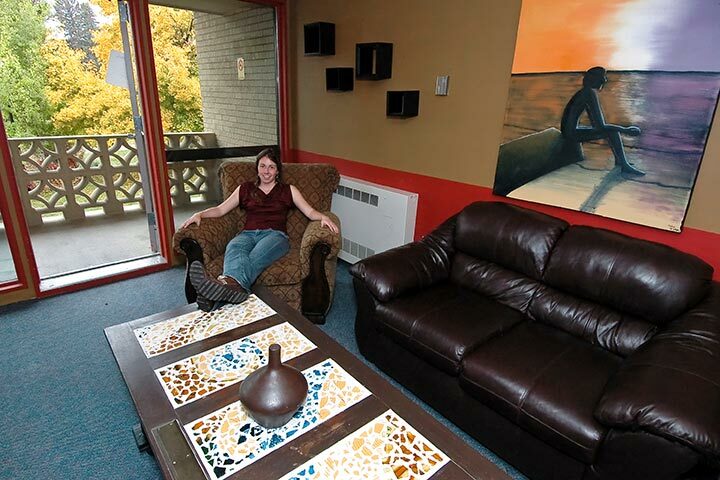 Suites are assigned by gender, with men and women sharing the same floor and oftentimes being neighbors. Students living in Rimview Hall are welcome to sign up for any meal plan, but are not required to purchase one. View a floor plan and more photos. 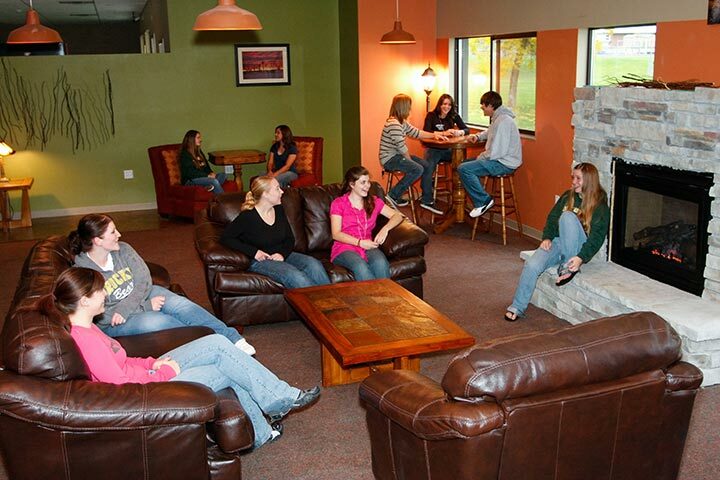 Available to students with a junior or senior class standing or students 21 years of age or older, Jorgenson Hall offers double and single occupancy, apartment-style rooms with private entrances. Each double occupancy unit is approximately 728 square feet. The 10 single units have differing floorplans in each; for specific layouts to single apartments please see the Office of Residence Life. Units are unfurnished, but come equipped with a full kitchen and bathroom. Amenities include a full-sized refrigerator/freezer, stove/oven, double sink, heating, and air conditioning. Internet and laundry facilities are included. 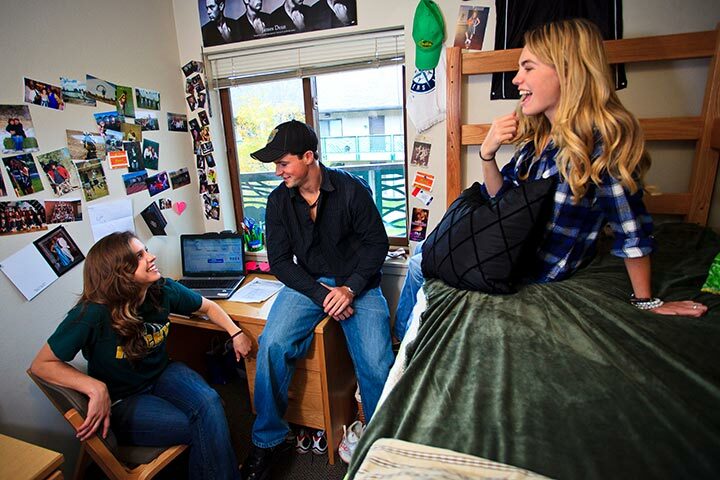 Apartments are assigned by gender, with men and women sharing the same floor and oftentimes being neighbors; students can request specific roommates of opposite gender in the Office of Residence Life. View standard double floor plan and more photos.